From the Page editor section, choose the page you wish to add content to, and click the Edit Page button. I'm going to use the About Page as an example. Once you click the Edit Page button, you will see the content editing page as it exists by default. 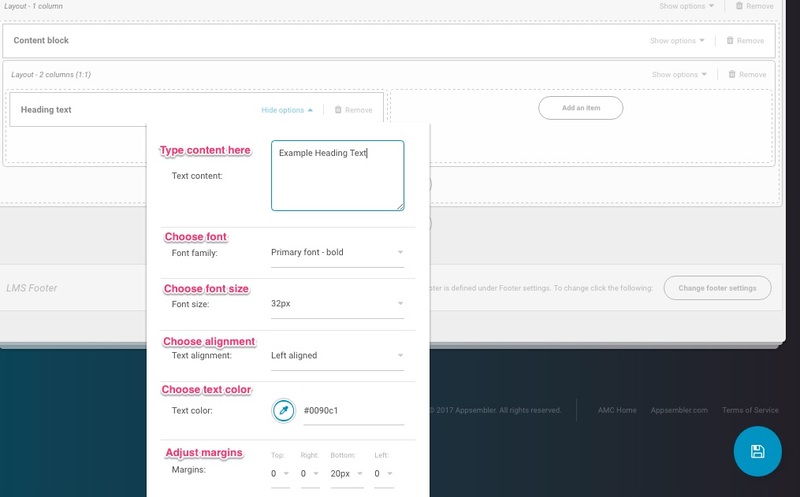 Each of the static pages comes with example filler content in the form of one 2-column layout block and one 1-column layout block. To see how the content looks by default, click on the "View page in browser" button in the upper-right corner. For more about how Open edX content is structured in AMC, check out this article. Wherever you want to add content, click the "Add an item" button. I'm going to start by adding a layout block in order to further divide this section. Next, on the left column, I'm going to add a heading text item. Click the "Show options" drop down menu. This will expand the content editor. This is how all content is edited in AMC. 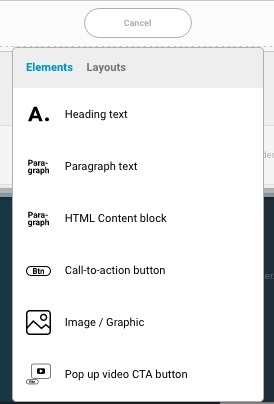 Anywhere you want to change the content itself, you will see a "Show options" drop down. Notice in the image above, you can see three other "Show option" drop downs on the right side. Every content element is a little bit different, but the basics are the same. A "Show options" drop down is where you add and edit your content. Here you will see all the potential options for making the content on your Open edX site unique. To close the "Show options" menu, simply click somewhere outside the "Show options" menu. Don't forget to click save in the lower-right corner of the screen! Any time you add or change content the Save icon will appear in the lower-right corner of the screen. Don't forget to save your changes. That's it! You now have the power to add all the content your heart desires to your Open edX site with AMC. Bonus: A quick look at all the content options. Here's a look at all the different elements you can add as content to an Open edX page.